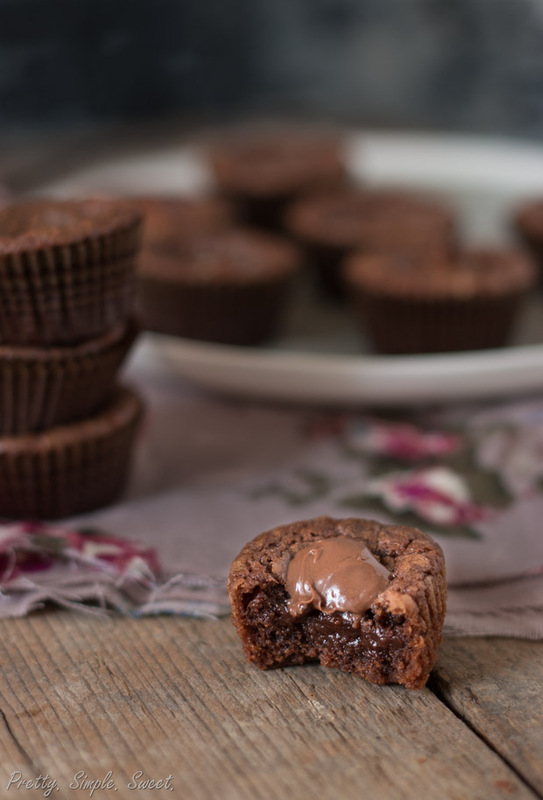 4-Ingredient Nutella Muffins | Pretty. Simple. Sweet. These rich and chocolaty muffin bites require only 4 ingredients, making them some of the simplest yet tastiest muffins around. 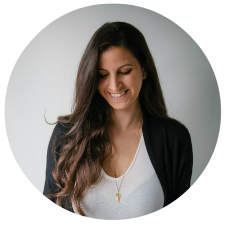 This morning, I took a few minutes to look back on my first blogposts. It feels like it was ages ago, but back then, I had zero knowledge of the blogging world. It was hard for me to decide which recipes to post since I wasn’t sure what you would like best. So instead of guessing, I started posting my favorites. My first ever recipe post was Nutella mousse. 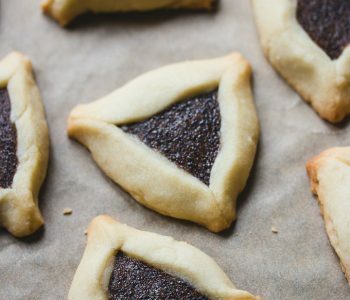 Made from only two simple ingredients, I was surprised when it became such a popular post! Since you guys loved it so much, I thought it might be a good idea to post another easy Nutella-based recipe. After all, you can never go wrong with Nutella! If there’s a full cup of the delicious hazelnut spread in a recipe, then you know that’s a good start. These muffins are made by mixing together just 4 basic ingredients. I experimented with different ratios and finally found the perfect balance. Adding sugar is optional, but I felt they lacked something without it. 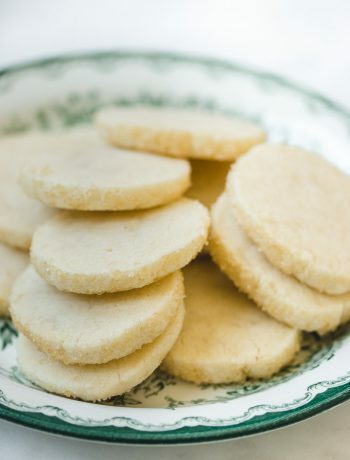 Alternatively, you can reduce the ¼ cup of sugar in the recipe to 2 tablespoons if you prefer. I also tried using 1 egg vs 2 and found that 2 eggs made it fudgier and more delicious. I experimented with 1 cup flour, 3/4 cup flour, and 1/2 cup flour, although I’m not sure what I was thinking by using a full cup. It was too much, but I ate them regardless. 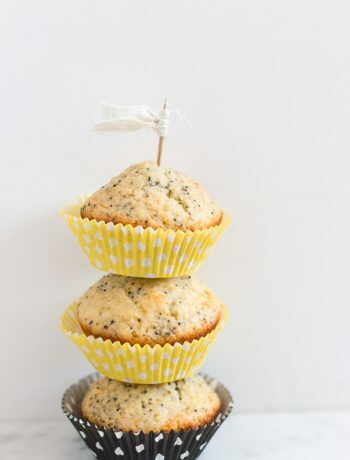 Personally, I prefer mini muffins for this recipe since they’re just as rich as normal sized muffins, but they’re so much more fun! Depending on your likes, this recipe yields either 28 mini muffins or 11 standard-size muffins. I know it’s not ideal for standard 24-cup mini size pans, but just go with the flow. To make the process easy and quick, I use an ice cream scoop to fill my muffin cups. 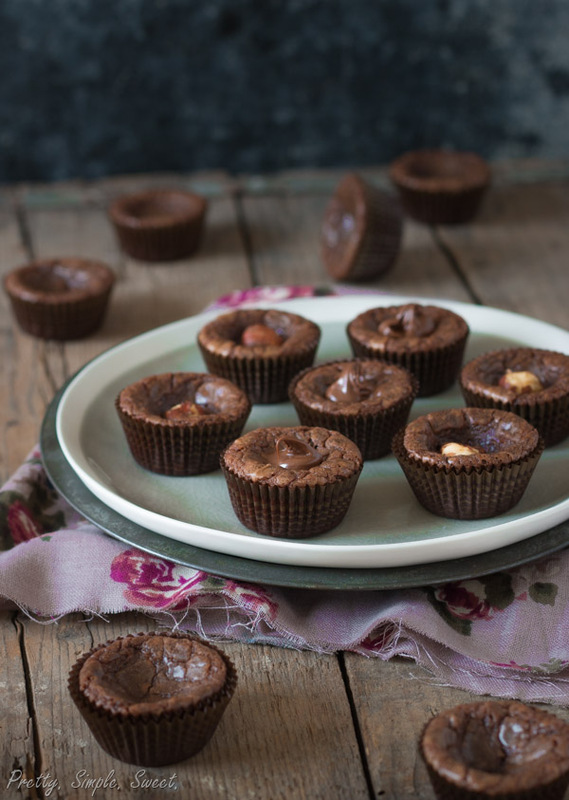 This recipe creates super fudgy, moist muffins with a delectable brownie texture. The secret? Don’t over mix the batter after adding the flour, and don’t over bake. My muffins were ready after only 8 minutes in the oven. While it’s always tempting to bake for longer, the drier these muffins are, the less taste and texture they’ll have. Bake until the tops are shiny and cracked but the center is still soft. While cooling, the muffins will sink slightly in the center (that means the center is super fudgy!). If you like, you can fill this little hole with extra Nutella and hazelnut, which looks perfect on minis. If your muffins aren’t fudgy, that means you over baked them, but it doesn’t mean you won’t be eating the whole batch anyway. I’ve been there. Preheat oven to 180C/350F. Line 28 mini muffin cups with liner paper. In a large bowl, whisk together eggs and sugar. Add the Nutella and whisk until combined. Sift in flour and fold just until combined. Divide mixture evenly between muffin cups, filling them about ⅔ full. Bake for 8 minutes for mini muffins or 12-13 minutes for standard-size muffins, until the tops are shiny and cracked but the center is still soft. Transfer to a wire rack and let cool for 10 minutes before removing from pan. The center will slightly sink after cooling. 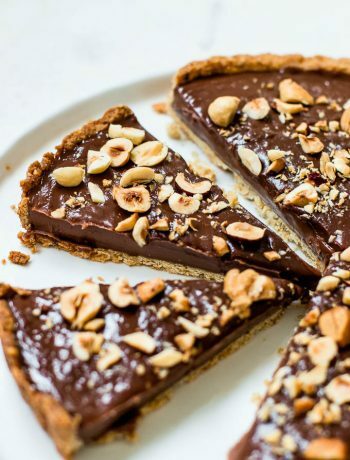 You can fill this center with an extra dollop of Nutella and hazelnut. Serve warm or at room temperature. Muffins are best the same day they are made, but they can be stored in an airtight container in the fridge for up to 3 days or frozen for up to a month. You can’t beat a muffin in miniature form :). 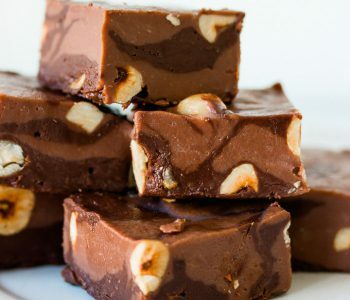 Um, and the fact that these are made with only 4 ingredients totally blows my mind! I am seriously in love over here! Anything with nutella and I’m in love. Now I’m totally craving these! Will have to try this recipe! I’m totally in love with Nutella too! It’s sooo good! I’ve never left a comment on any online recipe I’ve found before but I just had to for these. 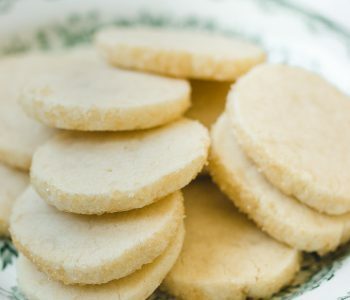 They were so simple to make yet delicious! I took them for a dinner party and only had 4 left. I ended up baking them for a few extra minutes (not intentionally) but they were still chewy and perfect! Dusted with powdered sugar and topped with strawberries, they were so so good!! Thank you so much for the lovely comment! I’m so glad you like them! Hi Erinzen! In this case, I wouldn’t recommend using a different kind of spread other than Nutella. Hi dear, I’d love to bake these miniature cupcakes. Do i have to whisk the eggs and sugar till stiff peak form? Hi Priscilla, you only need to whisk/mix the ingredients by hand until well combined. There’s no need to whisk the eggs and sugar to soft/stiff peaks. i wanting to make these at home and was trying to find some easy recipes on the internet and when i finally gave up i saw ur page and believe it or not its so great…!i look forward for u to share some eggless mousse desserts and other nutella filled desserts! i love nutlla and the chocolate mousse so plx share more and more of eggless desserts of this type!!!!! thnk u so so so much!!! If I don’t have the paper cups can I just grease the tin or what? Thanks! Usually you could, but these muffins are delicate because of their soft center, so it won’t be easy to release them from the pan. 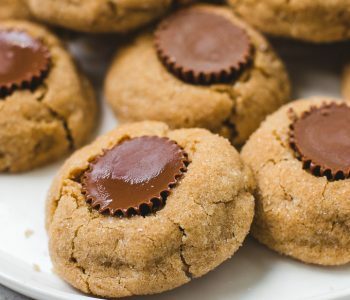 The easiest recipe ever and soooo popular I had to make another batch!!! Just noticed the center of the muffins are wet? Does that mean if I test the doneness using a skewer it’s okay if it comes out with wet crumbs? I’m thinking of serving these for kids but I’m not sure if the moist center needs to be more “done”. 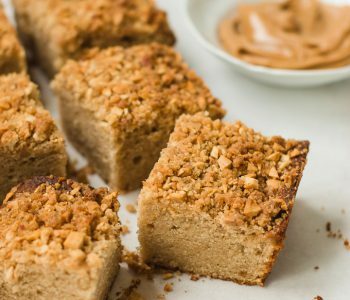 Yes, a skewer should come out with moist crumbs. The muffins should get cooked enough to make it safe to eat, although I can’t guarantee it because that depends on how long you bake it. Hi Shiran I have to say that I do try a lot of recipes I find on Internet and this one is my number 1. . 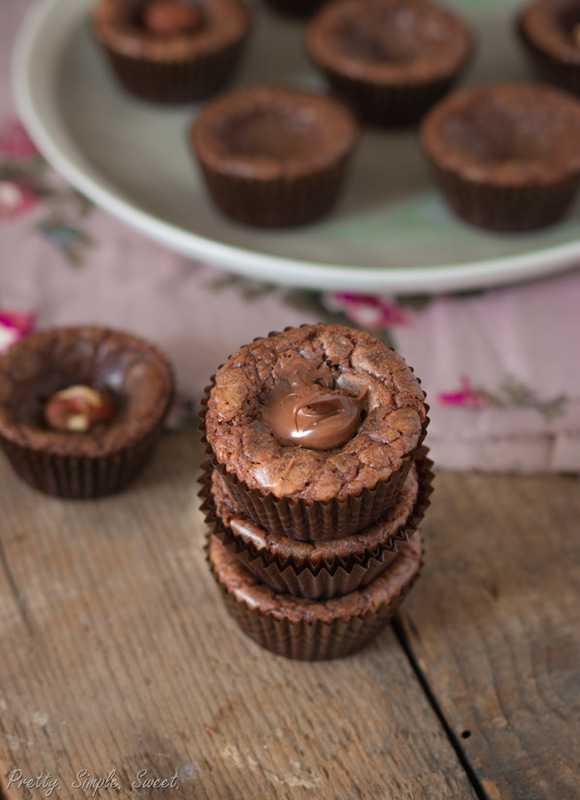 I made 48 mini nutella muffins for Easter and between 11 of us I there was none left and Ionly had one….lol. So thank you for sharing your recipe. Thank you so much, Simonne!